Richard Russell's Remarks - January 6, 2014 | American Precious Metals, Inc.
Gold prices may have declined substantially in 2013, but that didn’t dampen the desire to own physical gold. In fact, it may have spurred desire as demand for gold coins surged. According to figures from the World Gold Council, demand for gold coins was up 63% during the first three quarters last year. Sales of Canadian Maple leaf coins were up 82.5% over the same timeframe, and the US Mint sold 14% more American Eagles and a record amount of silver coins in 2013. 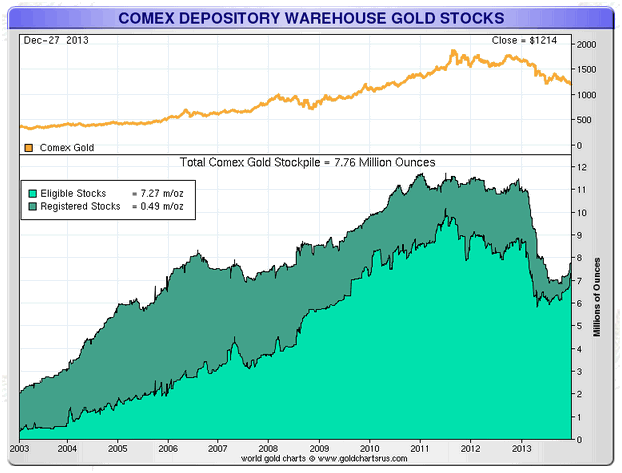 This further illustrates the separation between the physical and paper markets for gold. Unlike physical gold, the contracts for paper gold, which determine gold’s price, are virtually limitless. Any two parties who are interested in placing opposing bets on the metal’s price can do so, and in most cases these parties have no desire to own the precious metal in question. They simply want to cash-settle the profits or losses that accrue. If demand for physical gold remains strong it would seem that we must reach a point at which the differing supply-demand dynamics between the physical and paper markets must converge. Many have been looking at the inventories of ETFs like GLD and exchanges like the COMEX for signs of physical metal depletion. In the chart below we can see that the amount of Registered gold — that which is available for delivery — declined substantially in 2013. The precipitous drop has resulted in very little gold left available to satisfy demand from large investors wishing to take physical possession. The “Eligible Stocks” listed below refer to metals that conform to the exchange’s requirements, but are not available to satisfy delivery on futures contracts. This gold is stored at COMEX warehouses on behalf of banks or private parties. 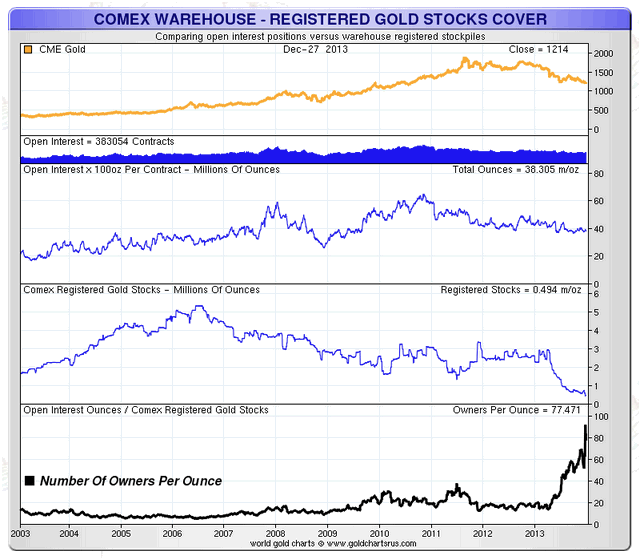 Another interesting chart (below) again highlights the recent decline in COMEX registered inventories, and also demonstrates the strikingly high number of claims per given (registered) ounce of gold. In the bottom chart below, you can see that we’re currently fluctuating between 77 – 92 owners per registered ounce. As I mentioned above, many large investors buying and selling futures contracts have no desire to own the physical metal, but if that were ever to change it would be a very fast game of musical chairs, with only one chair per nearly one hundred players. Keep in mind that the number of owners per ounce has not spiked as a result of more contracts for gold, but as a result of the dramatic decline in registered (available) gold held at the COMEX. Some of this information speaks bullishly about gold, but remember that price trends also tell a very important story. The trend in 2013 was down and may continue, but so far the trend in 2014 has been up. This has centered gold back on our radar, but two days of data is not enough to derive any conclusions. It is possible that the strength on Thursday and Friday came from investors re-entering positions after exiting for tax purposes in December. 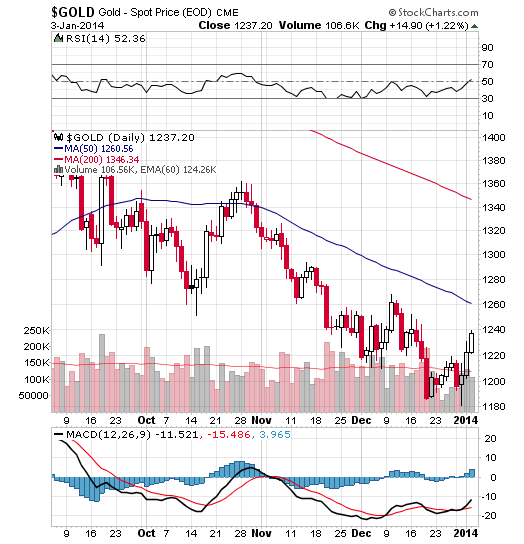 As is frequently commented here, demand for gold from the East continues to rise. According to Albert Cheng, head of the World Gold Council in China, in 2002 when the Shanghai Gold Exchange was established, the investment market was 2-3 tons. The estimated investment market for 2013 is roughly 350 tons, quite a substantial increase. China has surpassed Japan as the second largest world economy and is now stepping ahead of India as the largest consumer of gold. Based on World Gold Council figures, currently over 50% of physical metals are consumed by India and China. The US represents 6%. China also produces more gold than any other country. In terms of central bank purchases, the last time that the People’s Bank of China reported their holdings was in 2009. Lots of speculation surrounds how much gold they currently own and when they will finally report another figure to the International Monetary Fund. It seems natural to assume that central bank investment in gold has increased, considering the dramatic rise in demand by individuals. China has gained substantial wealth over the last decade through exports and has no doubt been looking to diversify its foreign reserves, especially considering issues such as the 2008 financial crisis and US government shutdown this year. In China you can buy a gold savings account. This works very similarly to a savings account in the US, except that you can direct the bank to buy gold with your savings on your behalf. This allows savers to purchase small amounts of gold at a time (such as grams), and the bank will apparently purchase physical gold on the saver’s behalf. The accessibility of this method is one reason demand for gold has been so high.